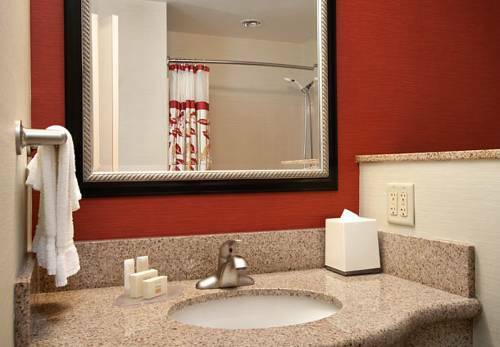 Enjoy modern decor, comfortable rooms and a convenient location just 25 miles from New York City at Courtyard by Marriott West Orange. Our West Orange, NJ hotel is located in West Orange, NJ near Prudential Center, Seton Hall University, Montclair State University and the Turtle Back Zoo. We're also near top businesses, including ADP, St. Barnabas Hospital and Prudential Insurance Company. Easily reach Manhattan, a 25-mile trip, using the New Jersey Transit. During your stay at our West Orange hotel, enjoy updated guest rooms and suites with complimentary WiFi, 32" flat-screen TVs and upscale bedding. Catch up on work, socialize or relax in our new, modern lobby featuring meeting space, a business library, cozy seating and a 52" GoBoard touchscreen TV. Stop by The Bistro Eat. Drink. Connect. in the morning for your favorite Starbucks specialty drink and quick breakfast or in the evening for dinner and a full bar. Relax and recharge in our indoor pool and fitness center. Modern comfort awaits you.